Rhymba Hills® herbal infusion only offers the best that nature has. Our plantations are located in the food basin of northern Peninsular Malaysia. All of our product are naturally caffeine free, and we only use 100% natural ingredients, with no flavouring or additives. Each box contains 10 sachets x 2 gram. Each sachet is individually wrapped in aluminium foil to contain freshness. Rhymba Hills® herbal infusion only offers the best that nature has. Our plantations are located in the food basin of northern Peninsular Malaysia, ginger from Bentong, Pahang, and cinnamon from Sri Lanka. All of our product are naturally caffeine free, and we only use 100% natural ingredients, with no flavouring or additives. Each box contains 10 sachets. Each sachet is individually wrapped in aluminium foil to contain freshness. Thus, in our bid to be environmental friendly, we would like to create awareness about the eco-friendly rice husk with inner ceramic flask. 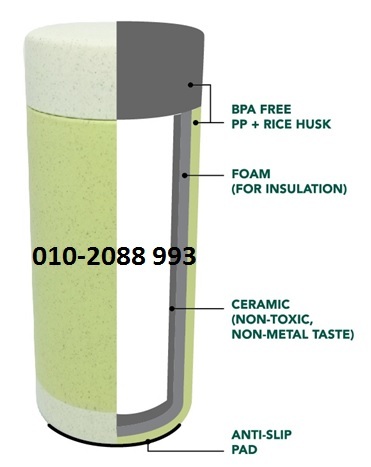 This flask is made of rice husk waste, which is a byproduct of rice harvest. Instead of burning off the rice husk, thanks to the advancement in technology, it is combined with PP, to form a material. 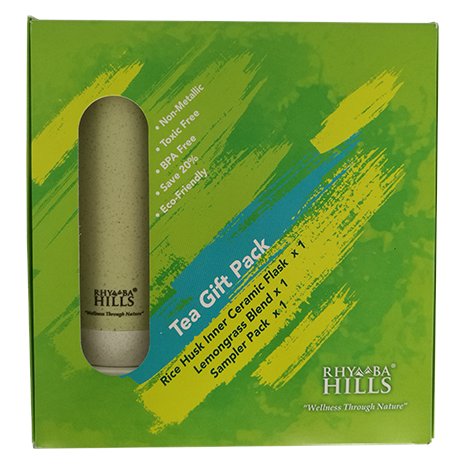 Why Rhymba Hills Rice Husk Flask with Inner Ceramic? This flask is perfect as a gift and to help keep your favourite beverage warm for at least 2 hours!